This is an easy side and very tasty. 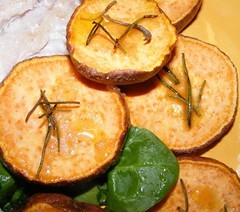 I sliced some sweet potatoes and cooked them at 375 degrees for about 20 minutes. Sprinkle the medallions with sea salt and olive oil and then top with rosemary sprigs. I served this along side wilted spinach and some sort of fish that was not at all memorable, but these sweet potatoes will definitely make it into the rotation. YUM!